My name is Jeanette and I am from Maryland, USA. Today I am one week post-op from a full body lipo and a double arm lift. 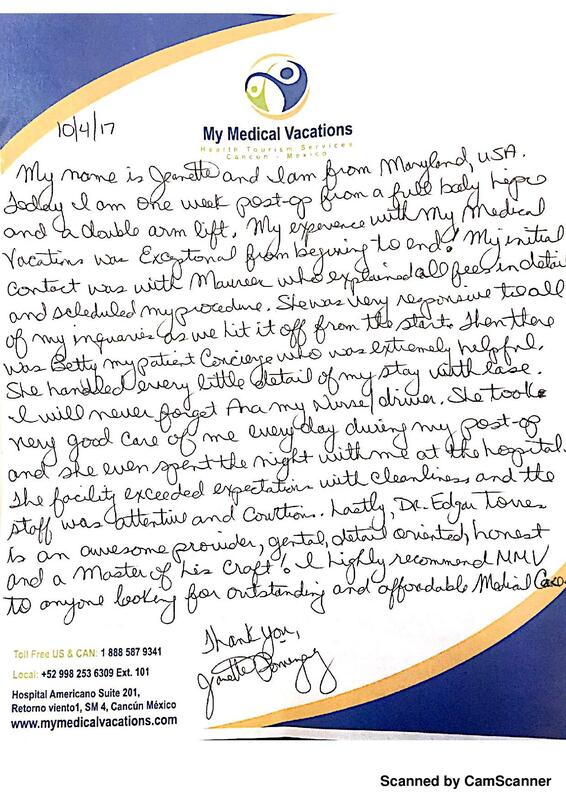 My experience with My Medical Vacations was exceptional from beginning to end! My initial contact was with Maureen who explained all fees in detail and scheduled my procedure. She was very responsive to all of my inquires as we hit it off from the start. Then there was Betty my patient Concierge who was extreme helpful. She handle every single detail of my stay with ease. I will never forget Ana my Nurse/driver. She took very good care of me everyday during my post-op and she even spent the night with me at the hospital. The facility exceeded expectations with cleanliness and the staff was attentive and courteous. Lastly, Dr. Edgar Torres is an awesome provider, gentile, detail oriented, honest and a Master of his Craft! I highly recommend MMV to anyone looking for outstanding and affordable Medical Care.